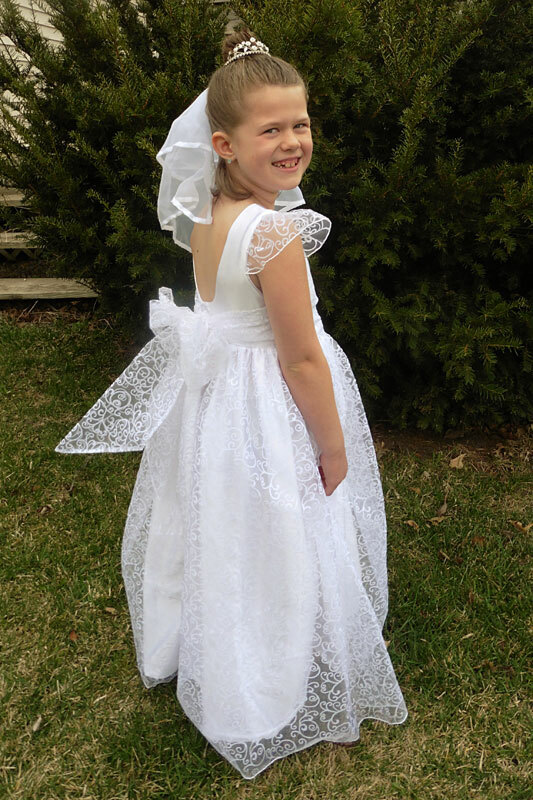 Kenzie’s Party Dress in Satin and Organza – Everything Your Mama Made & More! 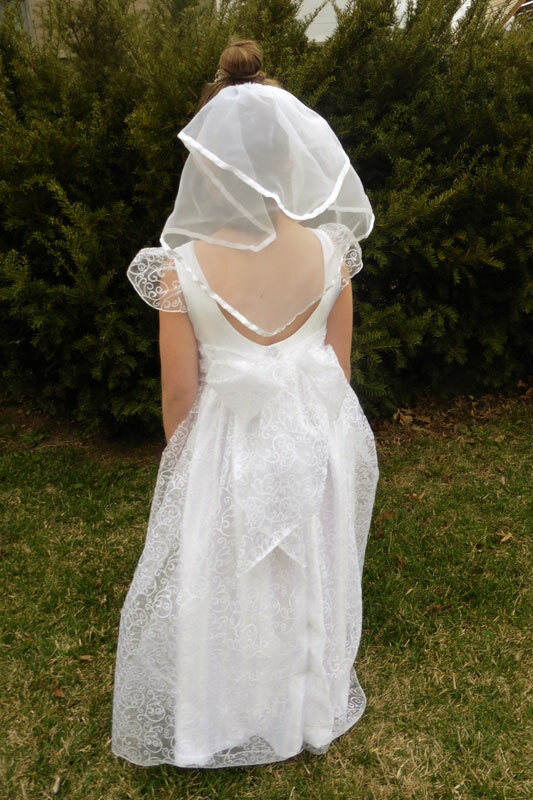 This weekend, my younger daughter will make her First Communion and she asked for a fancy mama-made dress for the celebration. Until this week, I hadn’t sewn with “real” satin (I’m not counting the cheapy costume stuff used for Halloween) since I made my senior prom dress as a 4-H project over a decade ago (and my mom’s friend helped me with that project). 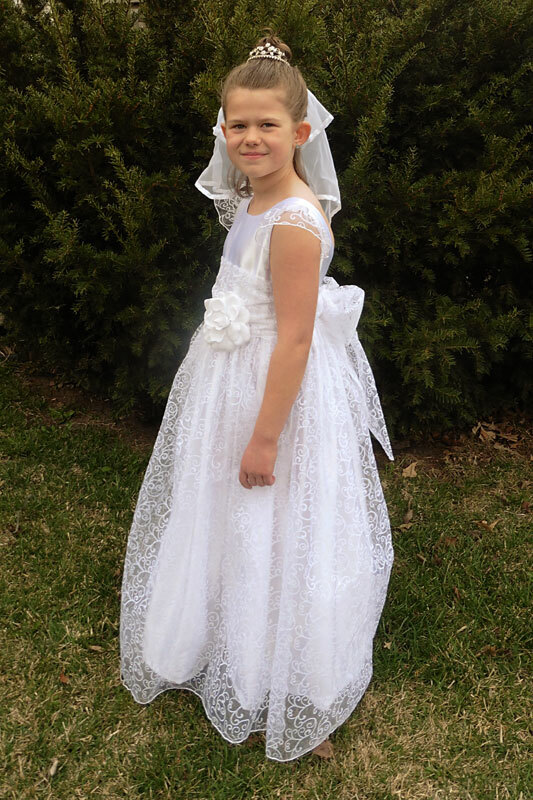 Even three years ago, I wasn’t confident enough in my skills to tackle special occasion fabrics for my oldest’s First Communion so I only made her veil. My girlie requested that her dress be floor-length and have a “see-through skirt layer” and a flower that pinned on the waistband. She left the rest up to me, so I decided that a tried-and-true pattern would help me face my fears. I dug out my copy of Kenzie’s Party Dress and went shopping for special occasion fabrics. After considering my options, I decided that the thickness of crepe-back satin would be easier to handle than regular satin. I bought enough for the lengthed skirt, bodice, and bodice lining. I picked out swirly flocked organza to use on the cap sleeves, sash, and for the “see through layer” overskirt. When cutting out my pieces for the skirt, I just cut one of each fabric. I sewed up the side seams, hemmed each one, and then basted them together st the top and treated as one when attaching to the bodice. To make the simple skirt on Kenzie’s Party Dress floor-length, I had her try on her Christmas dress made from the same pattern and measured from the waist seam to the floor. I figured that the seam and hem allowance would make it just short enough to not trip her but still be long enough to fit her request. For my 50-inches-tall daughter, I cut the length of the skirts to 33 inches. I hemmed the crepe-back satin with a 1 inch tall blind hem stitch and then used my serger to put a rolled-hem on the bottom of the organza overskirt so it’s a tad longer than the underskirt. Instead of lining the cap sleeves, I used one layer of flocked organza and applied a rolled-hem along the outer edge. I also made the sash from only organza so it would be light and flowy, but did not deviate from the pattern for it. I chose to make the bodice from just the crepe-back satin for a little contrast to all the organza. The final touch to her dress was to create the requested pin-on flower for the waistband. I picked out a white rose from Hobby Lobby’s bridal section and cut the stem off. I used a 2-inch circle of stiff stabilizer and hot-glued the back of the flower to one side and a circle of white felt to the other side. Then I hot-glued a bar pin-back to the felt and was done! Easy peasy! 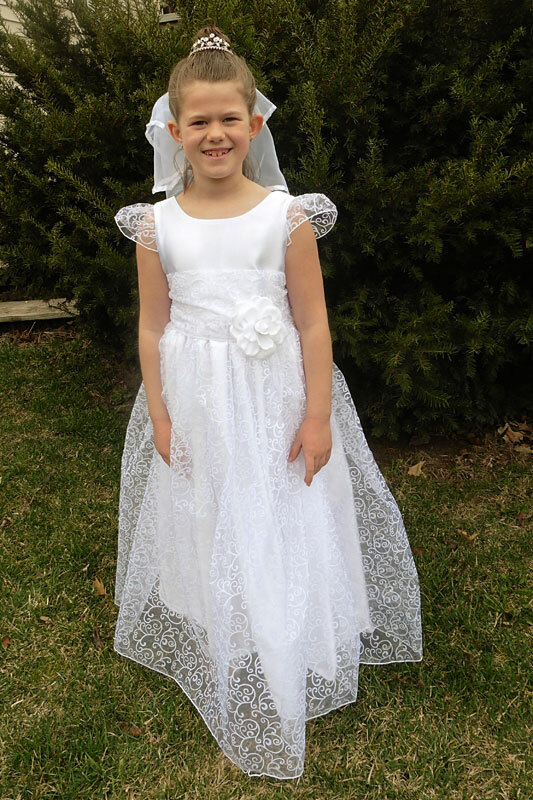 My little girl is thrilled with her First Communion dress and her big sister is slightly jealous so I must’ve done well facing my fears of special occasion fabric! She’s also excited to wear the little crown that I wore with my wedding dress and the same veil her sister did three years ago. I’m glad I mustered the courage to sew this special dress, but I’m equally glad that I won’t be needing to make more since the rest of my children are boys. Haha! Beautiful work on the dress. Both it and your daughter are gorgeous! It is something I would love to wear! Thank you! I love how it came out, but the fabrics sure stressed me! Such a beautiful dress. You did such a good job. Where did you find the lace. The dress is beautiful. 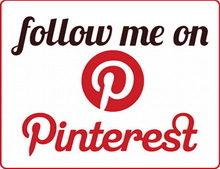 Thanks, I bought the swirl flocked organza at JoAnn’s. Great Mom, beautiful dress, blessed daughter. Hi Joelle, “The Dress” is just perfect! 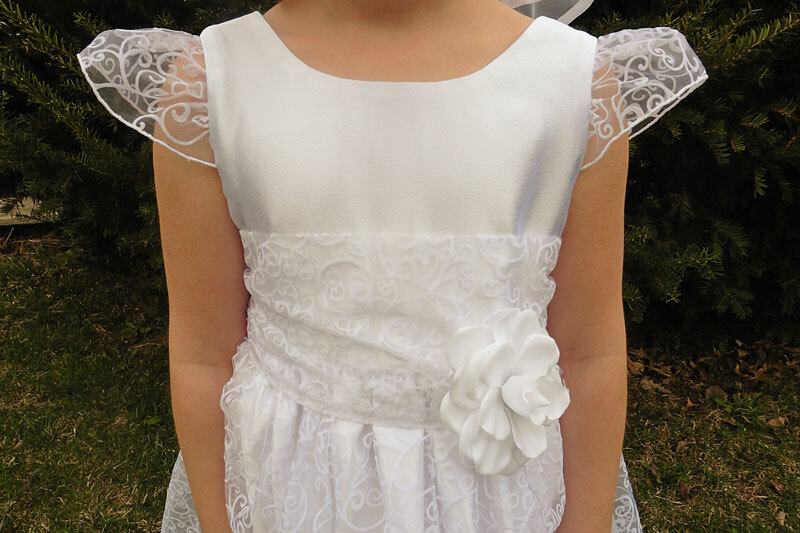 Your daughter will look and feel like an angel for her First Communion celebration. I love how she is so young but added her fashion preferences to the dress. I especially love that she will be wearing her sister’s veil and your crown, how special is that!! Well done Mom. I know those fabrics can be scary. My daughter loves them too. You did a beautiful job my daughter and I enjoyed the fashion shoot too. I hope you have a very special day to forever remember. You should be very proud! Congratulations to your daughter, it brings back happy memories seeing your daughter smile. Thank you. The celebration yesterday was gorgeous! We for sure have beautiful memories of the day! Great job! 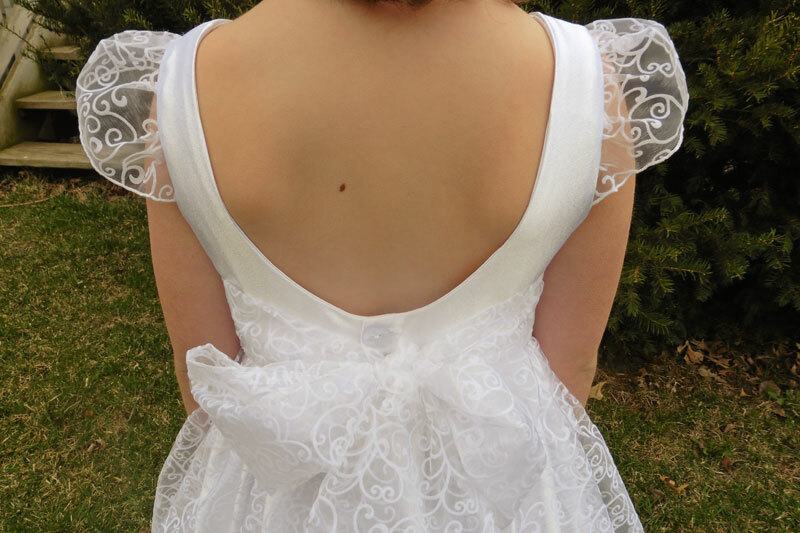 Beautiful dress….it’ll be a reminder when your girls ask you to make their formal dresses for high school dances!